General anesthesia is currently defined in the context of its use in clinical care . The mechanism by which anesthetic drugs induce general anesthesia is not well understood. There is therefore a need to incorporate neurophysiological characterizations into the definition and understanding of anesthesia. Distinct patterns in the electroencephalogram have been associated with anesthesia-induced loss of consciousness [2–4] and are used as part of protocols to monitor integrity of brain function . However, the transition to unconsciousness during a gradual induction of general anesthesia has not been studied systematically. Here we report results of multivariate frequency-domain characterizations of propofol induced changes in the scalp EEG of human subjects performing a behavioral task. In this task subjects were asked to respond to auditory stimuli while loss of consciousness was induced through gradual increase in propofol dosage. Subsequently, the dose was decreased and the subjects recovered consciousness. 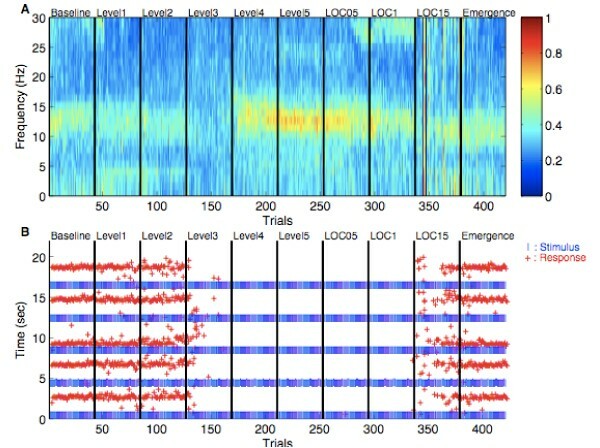 EEG was recorded from 64 channels sampled at 5000 Hz. Behavioral data was gathered throughout the recording period and subjects were required to keep their eyes closed. We characterize the temporal dynamics of the EEG through an eigenvalue decomposition of the time and frequency dependent cross spectral matrix. We find that the state of anesthesia induced unconsciousness as assessed from behavioral data is strongly correlated with the persistence of a single dominant mode in the high alpha low beta range (see Figure 1) concentrated in the frontal channels. As the propofol dose was decreased the contribution of this mode decreased as well. Our findings suggest that general anesthesia induced unconsciousness may be accompanied by a single dominant mode at selected frequencies between the frontal channels. (A) Fraction of total energy contained in the leading eigenmode. (B) Behavioral data. Supported by the NIH DP1 OD003646 (ENB), K25-NS05758 (PP) and GCRC 1 UL1 RR025758-01.